Each member of this exceptional four-part choir provides beautiful rich harmonies to create a soulful sound to make the heart ache. 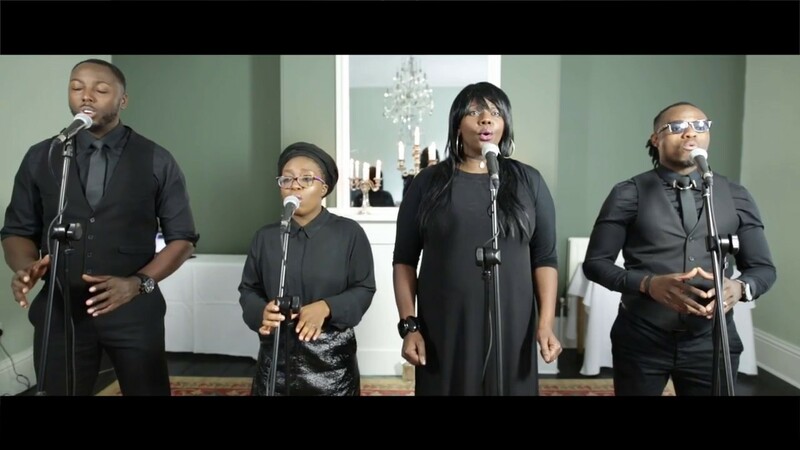 Unquestionably a sensational wedding gospel choir, their vast repertoire, which includes many recent hits, means they would also be ideal party entertainment whatever the occasion. The Gospel Choir is also suitable for Funerals. From £850 for a local ceremony or drinks reception. We were absolutely delighted with the performance the choir gave throughout both the ceremony and the drinks reception – it really added to the day making it even more special. Coming from a musical family, we are not an easy bunch to impress, but we were all overjoyed with how they performed. The vocals were incredible and they should all be extremely proud of their talents. It made my walk down the aisle and back so much more special and emotional and I cannot thank you all enough. We were also grateful they took the initiative to perform an extra song during the ceremony during the photos of us signing the register – flawless and professional. I did manage to catch them on their way out to thank them for their performance, but if you could please again reiterate our appreciation to them that would be fantastic. And thank you to you for all your help in making the booking run so smoothly without any hiccups and for being so accommodating with our song requests. I’d be happy to provide a more formal testimonial if that would be of any help, just let me know.